This shrine stands before the tomb of the five concubines of the Prince of Ning-ching of the Southern Ming Dynasty. They were Madame Yuan, Madame Wang, Hsiu-ku Lady Mei and Lady Ho. The Prince of Ning-ching, whose personal name was Chu Shu-kuei, was a descendant of the royal house of Ming brought to Taiwan by Koxinga (Cheng Ch'eng-kung) in 1662. There he dwelt in a palace built for him and his household until the advent of the Ch'ing armies in 1683. In June of that year, when forces of the Cheng regime met a crushing defeat at the Battle of Penghu and Commander Liu Kuo-hsuan began negotiating with the Manchus for terms of surrender, the Prince resolved to martyr himself for the cause of his collapsing dynasty. His concubines were the first to take their own lives as a sign of their fidelity to their lord; they hanged themselves in the palace hall. Their bodies were interred at a tomb on Cassia Bud Hill. Much later, in 1786, two Censors(high officials of the central government bureaucracy) visited Taiwan on a tour of inspection and were shown the tomb. To honor the memory of these women, they ordered Fang Pang-chi, who was Taiwan's maritime magistrate at that time, to repair the tomb, set up a memorial tablet inscribed with an epitaph identifying the grave, and establish a mortuary temple before the site-the Shrine of the Five Concubines. On the right side is a smaller shrine, 'The Tomb of the Loyal Servants,' which marks the burial place of two valets of the Prince's household who joined their Lord in his fatal vows. View of the shrine facade. The design of the building combines an altar for sacrifices on behalf of the spirits of the deceased and their actual placwe of rest. 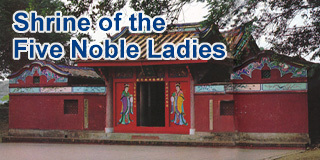 Though the scale is small, at the entrance is a three-leaved door, a sign of the status of these women as concubines of a prince of royal blood. Entrance is indented inward and it is called the wall of pa (pa is the Chinese character fo 'eight'). On the right side is 'The Shrine for the Loyal Servants'. View of the back of the shrine showing the grave mound.